I just wanted to show you all my latest finished painting! 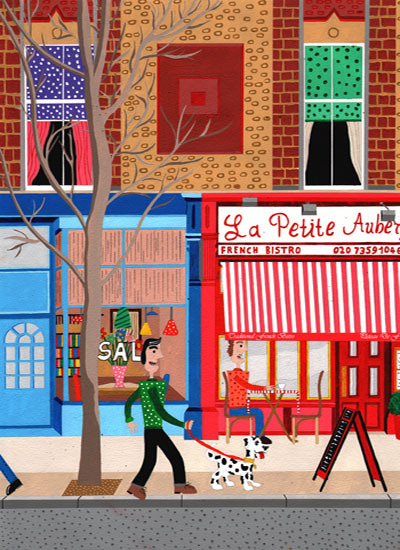 Titled “La Petite Auberge, Islington”, its a little painting which I’ve had good fun with. I found this lovely little street in Islington, with it’s independent shops and restaurants, and I thought it would be great to paint. The original painting and prints are available to buy as well. Next, I’ll be going back to painting large city scenes, with Rothenburg in Germany my next painting. The painting and limited edition prints are available to purchase from www.degreeart.com. I’ve had some great sales lately, with two paintings and several prints selling, so this is another great boost. I also received some excellent news from the hugely iconic London department store Liberty. As you hopefully know, earlier this year I was commissioned by them to create a painting of the iconic shop front to celebrate their 140th birthday celebrations. Early next year, Liberty will be producing a book to celebrate this, and my commission will be included in this, so another great boost and exposure for my work. Read more about… My new painting is complete, “La Petite Auberge, Islington”. Artist of the week on Degreeart.com and my artwork will be included in a book published by Liberty.